Experience your body, mind, and spirit through the ancient practice of Qigong, a Chinese Yoga. Qigong is over 7000 years old and is the foundation of Tai Chi . There are many different forms of Qigong. Qi or chi is known as vital energy. Gong is work or cultivating the life energy. In Qigong we open up all channels of energy in the body. We do this to release and dissolve blockages whether they be physical, mental, emotional, or spiritual. Qigong is a healing art that can benefit anyone. Most of the exercises I teach can be modified to meet an individual’s needs, abilities or limitations. Many Qigong forms can be practiced standing, sitting on chairs or in wheel chairs as well as lying on a mat or in a bed. Over the years I have studied many methods and forms of Qigong. I have been trained and certified to teach two methods, which are viewed as some of the best methods of healing in China. Beyond my certification I continue to study and enrich my skills with Grand Master Hui Liu of the Wild Goose (Dayan) Qigong, and with Master Mingtong Gu, of Wisdom Healing (Zhineng) Qigong. I teach both methods regularly at The College of Marin through Community Education. I present a variety of methods in my Qigong for Health classes. Specific forms are taught according to the different seasons of the year. (Wild Goose and Wisdom Healing Qigong are taught all year long). All my classes include warm ups, massaging acupressure points, meditation, and Qigong form. Summer- A variety of forms including 8 Brocades, Qitaky, Swimming Dragon and Five Healing Sounds as well as Aqua Chi. The flowing movements of Qigong and energy meditations have therapeutic benefits. They reduce stress and refresh the body with peaceful relaxation and renewed energy. Qigong can relax the mind and body, quiet the nervous system, benefit the heart and blood circulation, improve digestion, loosen stiff joints, improve balance, tone muscles, and refresh the skin. 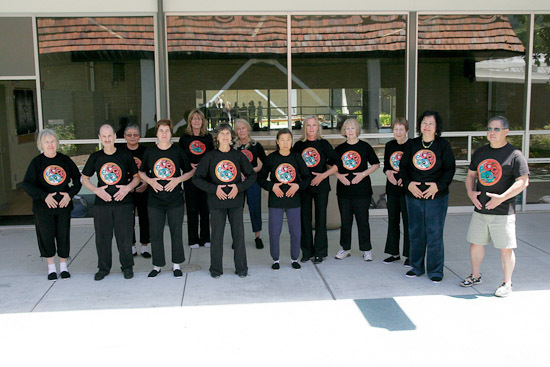 Qigong movements, gentle and steady, relax the body and reduce physical stress, resulting in a clear and refreshed mind. Numerous studies have shown how Qigong has improved health conditions including Arthritis, low bone density, breast cancer, heart disease, hypertension, Parkinson’s Disease, sleeping problems and strokes, to name a few. Benefits students can gain from daily practice include: improved energy, improved posture, physical strength, grounded energy, relaxation, calmness, improved sleep, increased awareness, being centered and focused, improved health and overall general well being. As Qigong is the basis and foundation of Tai Chi, all Tai Chi forms are fundamentally Qigong. Tai Chi styles are refined forms of Qigong, based on Martial Arts such as slow motion Kung Fu. These beautiful fighting practices need to be very precise for self-defense and require many years of training. Most Qigong styles are Healing Arts, connecting with nature, heaven and earth energies, for overall balanced well-being. Qigong is usually easier to learn than Tai Chi and the benefits are very powerful. Pre Register for all College of Marin Classes thru the college on line, through mail, or in person. The Community Ed Catalogue is sent out a few weeks before the quarter begins. If you need financial assistance, you must apply within the first 2 weeks of registration. The Wild Goose Qigong and Wisdom Healing Qigong are both offered through COM. Register at www.marincommunityed.org. All other classes, including Kaiser, register when you come to class. Classes are ongoing, you may join at any time. Payment for Kaiser classes is on a month basis or you can pay drop in rate. A waiver form will be provided to sign at your first session. Please wear comfortable clothing that does not restrict your movement. Wear comfortable flat shoes with clean soles. Note that street shoes are not allowed in COM class rooms, bring slippers or extra pair of clean shoes. All classes are structured differently. Morning classes are 1 hr long taught 1/2 hr sitting in chairs and 1/2 hr standing. Those not able to stand can remain seated. Wisdom Healing Qigong classes are 1 1/2 long, taught sitting and standing. Wed Evening Qigong classes are 1 1/4 hr long, taught first lying on mats, sitting, then standing. Wild Goose Qigong classes are 1 1/2 hr long, taught mostly standing with some sitting massage and meditation. To assist the learning process and practice of Qigong, materials are available for purchase. Some classes have free handouts. Wild Goose Qigong class requires a Wild Goose Qigong Workbook which can be bought at the COM Bookstore for under $5. Additional books and DVD’s are available to order in class or directly from www.wenwuschool.com. Wisdom Healing Qigong class has free promotional materials. In addition books, DVDs and CDs can be ordered directly from www.chicenter.com. Qigong Classes have supplemental handouts of the different styles taught. DVDs of Moving with Chi, Dragontales and 5 Animal Frolics can be ordered in class or online at www.dragonartsstudio.com.